Stoopenchataya or ‘Stepped Chain’ (aka Petersburg Chain) is a soft, flexible stitch that can be shaped into a variety of configurations. In this bracelet project, a stepped chain is shaped into a wrist-sized oval, and the space between is filled with rows of sparkling crystals. This bracelet can be made to fit virtually any wrist size. 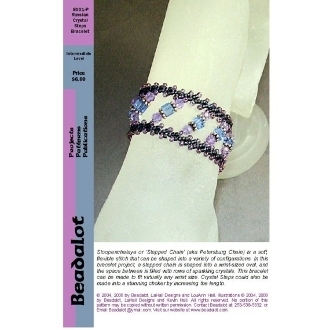 Crystal Steps could also be made into a stunning choker by increasing the length. You'll need delica beads, 11\/0 seed beads, 4mm round crystals, 4mm cube crystals, 4mm metal discs, and a clasp to complete this project. You'll also need #12 beading needles and nylon thread.